I stepped off the train in Ulaanbaatar ("UB"), Mongolia's cold and smoggy capital, about two months ago. A lot has gone on since then, but most recently, I've begun to travel into the countryside to collect DNA samples from bankhar. It's been a nice break from meetings and emails. At first, I was concentrating mostly on finding somewhere to set up the kennels and the breeding program, but within the past two weeks I started calling contacts in the countryside and trying to track down some bankhar. Finding the contacts was not too difficult, speaking with them has been a different story. Unfortunately, two months is not enough time for this particular researcher to become fluent in Mongolian. It became clear early on that I would need to have the help of a translator, and luckily, I found Meg from Meg's Adventure Tours LLC. She kindly gave our organization a discounted rate, as she has done her share of non-profit work in the past and understands a budget, and she has been an essential part of the DNA collection trips. Meg made some calls to our contacts, who ranged from village veterinarians to friends' distant cousins, and asked around for bankhar. 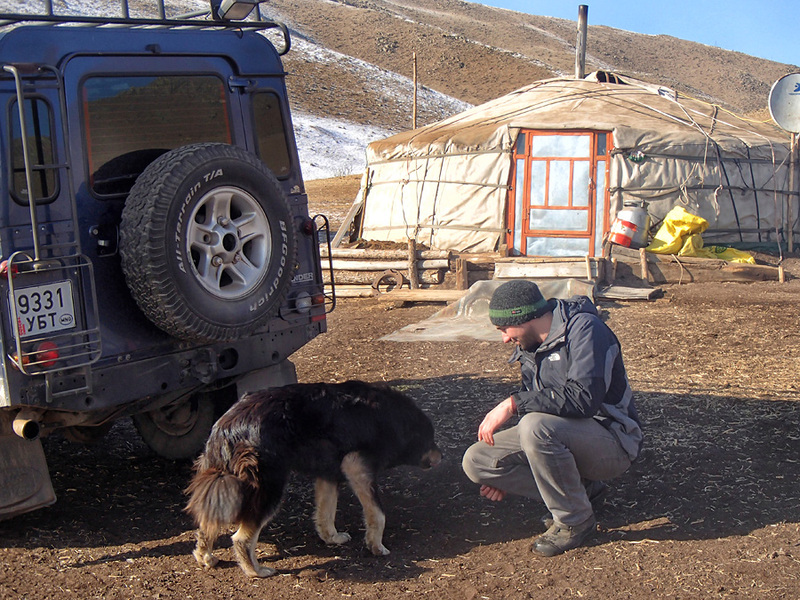 Once we found a few people who told us they could take us to families with the types of dogs we were looking for, I borrowed a truck, we filled it with some snacks, and we were off for Daschichillin soum (a "soum" is a Mongolian village) about five hours west of UB in Bulgan province. The trip went quite well. Two bankhar, two DNA samples, and zero bites. It also turned out to be an interesting time to visit with herders. Because it's springtime, there's fawns, piglets, camel calves, and goat kids running around everywhere. It's also the time of the year that herders collect wool from their sheep. Even with all the work that needs to be done, every family we visited invited us into their ger (before they even knew why we were there) and offered us tea and snacks. They each answered my survey questions and then took us out to see their bankhar. The first bankhar we met was not the most trusting of bearded foreigners with cheek swabs and a camera. I tried to get close for some good photos and a measurement, but he quickly made it known that I wasn't welcome. The owner had to measure him and take the cheek swab sample on my behalf, which was perfectly fine with me. After having lunch with a local family, we headed back down the highway to where we spotted an unsupervised bankhar out in the pasture protecting a herd of goats. Just what I had been looking for. We turned off the pavement and onto the dirt tracks that led up the valley, and drove until we found a ger. The owners were very excited that people were interested in learning more about bankhar. 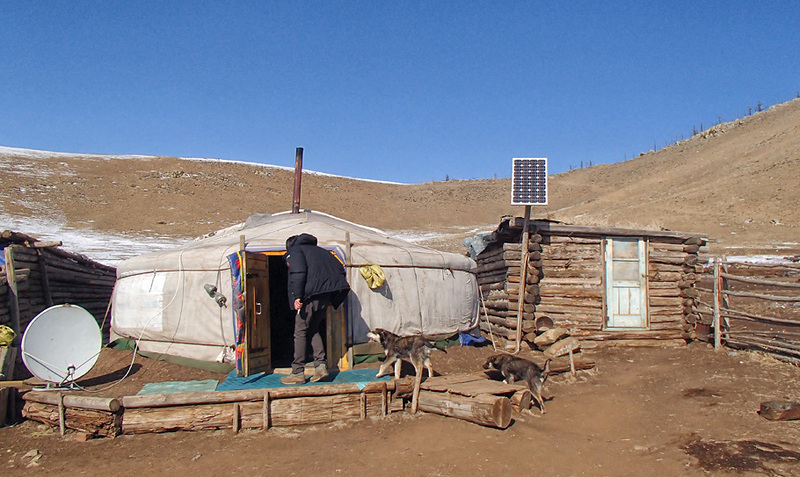 Bankhar have a long tradition in Mongolia, and though they aren't as common as they once were, Mongolians are still very proud of their nation's breed of dog. This particular bankhar was much more tolerant of people then the last, and had no problem donating some of his saliva to the cause. We headed back to UB and the next day I gave the truck a "once over" before starting our drive for our next destination: South Gobi province. Meg, a mutual friend of ours, and myself packed the truck and headed off to the desert. About thirteen hours after leaving UB, we pulled off the dirt road we had been bouncing along since the pavement ended five hours ago, and set up camp. It was my first night spent out in Mongolia away from the city lights. The Gobi reminded me of other places I had been. Sort of like parts of Idaho and southern Utah. It looked a bit like sagebrush country, but though it looked familiar, it didn't feel it. In the Gobi, I found it impossible to forget that I was further from any major metropolitan area than I probably have ever been before. The next day, we managed to get four saliva samples from bankhar, then pointed the truck back north, and made the dusty, day long drive to UB without incident. This week I'm hammering out the details on my trip to Khovd province. It's far west. On the border of China and a stone's throw from Kazakhstan. Most people I have talked to tell me that Khovd is one of the only provinces where the bankhar population is still isolated and "pure." I'm looking forward to getting out there, but first have to figure out what will be more cost effective, making the three day drive, or flying there and hiring a vehicle on arrival. Either way, I'm excited to see what Khovd has to offer, and I'll take plenty of pics.